That, my friends, is how this table got its name! Well my table has been patiently waiting for me to be INSPIRED to make it BEAUTIFUL again. It is an antique table with porcelain casters...I knew it had be something special. It was sooo old..it deserved better. the little nick's and scratches that showed how loved it was..So I sanded the old lacquer off and put on a fresh coat of walnut stain. Destin Gulf Green. While that was drying I started on the chairs. BLECHHH!!! I had gotten them at Goodwill for 3.99 each. The paint was SHINY!! Then the fun part...Recovering the chairs with my left over fabric that I also got at GOODWILL for $2.99. Here it is...This is where the whole James Brown song came into my head....The blue with the black and white just reminded me of the outfits he used to wear. I loved how it was all coming together and was really excited for the next part. I wrote out the words Bon Appetit and filled them in with my White Krink Paint Pen. and a little FLEUR DE LIS! 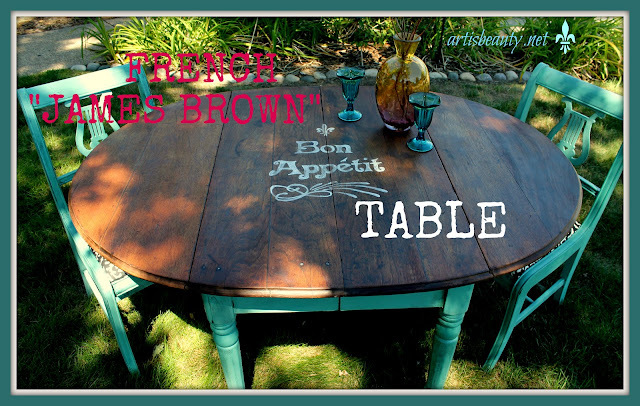 and my table became known in my head as "THE FRENCH JAMES BROWN" lol. This one is gonna be really hard to let go. I am so happy with how it all came together. I hope you enjoyed this tutorial..I know it was a lot of sweating for me (much like James Brown when he sang). This was a 2 shower a day 2 days in a row project, but man oh man...Was it worth it.! Oooooo! Super awesome is what it is! LOVE! (And in my head I'm thinking... I have Destin Gulf Green in the shop. I have three tables. I have two sets of chairs. Hmmmmmm..." LOL!!!!! Looks fab, Karin!!! This is amazing (you always have the best projects)! Can you e-mail me? I want to extend an invitation to you! Wow! What a beautiful table. You did a fantastic job! ROFL!! I LOVE the name!! The table is beautiful!!!! Amazing! Beautiful! Love it! Thanks for sharing it at the All Star Block Party. Gorgeous table! It turned out great! Thanks for sharing at the All Star Block Party. What a gorgeous table you've created! I love it, it's beautiful, you did a super fantastic job. And you were crazy lucky to get that great old drop leaf table. Thank goodness you did! Makes me think I should "Get Up Offa That Thing" and get some projects done. I feel good!!!! So good, so good! Just looking at it. You have outdone yourself, and I love that the chairs have a little Lyre musical thing that goes with your whole music thing you have going with the mood! I just want to kiss you for transforming that piece into a beautiful creation!! WOW!!!! It turned out AWESOME! Job well done, it's beautiful! Visiting from 504 Main's party! A gorgeous set - I love the whimsy and the great color scheme! You totally crack me up! Love love love how awesome this looks! It's perfect on so many levels Karin... love it!! Thanks for linking up at Shabbilicious Friday this week. That looks fabulous. Hope you will join my weekly Wow party sometime with your projects. Popping in from HomeTalk blogger's facebook. Love the green and the typography! Great job! Love, love, LOVE this! Gorgeous! You go grrrl, in all of your James Brown badness self - you did an amazing job. Wow! Popping in from Shabby's link party. What a fantastic find....I love that you left the top dark. Looks great. Your table is fabulous! But I'm loving the harp back chairs! What a great combination! Wow...what a great Cinderella moment for this piece!! So happy I stopped in! Gorgeous! I can see why this would be so hard to let go. Thanks for sharing at this week's party! What a awesome idea! We would love to invite you to join us on Saturday Show & Tell on Cheerios and Lattes! I know my readers would love your awesome ideas! Have a great weekend! Beautiful work, love those curb finds!! I LOVE this table. You did a really good job on it. I would love for you to share this at my Monday party. It opens at 6pm tonight. Hope to see you there! I'm loving you dinning set, so very pretty, love the color and the stencil you added. You did a great job, and now seeing it it was so worth the 2 showers a day! Beautiful! Thanks for sharing your creative inspiration with Sunday’s Best – you helped make the party a success! What a lovely transformation!My Get Social Sunday link party is live. Would love to have you come link up your homepage and promote your blog! What a great after. And I am glad to know I am not the only one who works up a sweat when making over furniture. Thanks for sharing on Tout It Tuesday. Hope to see you tomorrow. I ALWAYS love your projects Karin! You are amazing. This table is so awesome. Thanks for linking up at Doodles & Stitches! Great work! Love how your table turned out! Great job! It's all looking mighty spiffy now! Why is it I never find anything like that at Goodwill? I can't imagine getting a chair that cheap. I absolutely loooovvveee how you transformed the table and chairs. 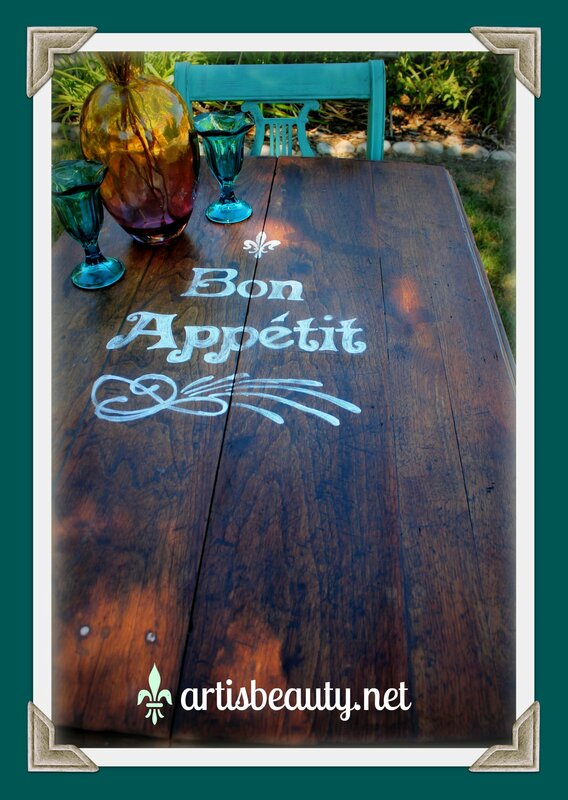 I love turquoise and the "Bon Apetite" is a cute touch. Thanks for sharing. omg i have that table and those chairs! painted the table white and the jury is still out on what i will do to the lyre back chairs. love what you did! so charming. What a great transformation!! I love that you kept the top wood and didn't paint it solid. Thanx for coming to the party! Oh wow!!! This is so incredible!! I just love it...and have my own old dining room table that needs redoing...what an inspiration this post is!! love the dark rustic wood top! GORGEOUS!!! Absolutely love it!! Featuring you tomorrow at the party! Thanks so much for linking up. Beautiful! I love the mix of painted with a rich stain. Great job! It has so much charm now! Love it! Love the color with the stain. great redo. Someone will love this set for years to come.